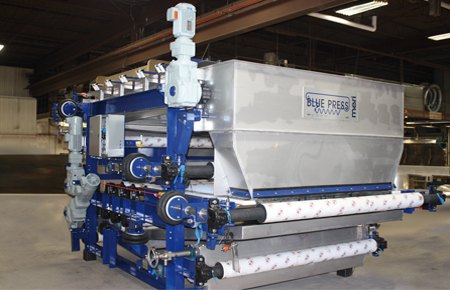 BLUE PRESS SeriesThe BLUE PRESS Series is a line of belt presses specially developed for dewateringand thickening of primary and secondary sludge. Their design makes themsuitable for different sludge characteristics and biological sludge content. The gravity area, installed prior to the wedge and pressing area, allows for thetreatment of sludge even at low consistency. The application of pressure rollstogether with the specially designed pressure pattern area achieve a highdryness even for sludge with low structural material content.